Flippagemaker Free Flip Book Maker – Online flip book maker for text file! Free Flip Book Maker is a free yet amazing page flip creator. This free flip book maker is specially designed for Text (. *TXT) files. And it is becoming more and more powerful and professional. With useful configurations and beautiful flash templates provided, now you can turn the dull Text files into lively flash digital publication with fantastic page flipping effect. What's more exciting is that you can use this freeware to publish online flip book, flash page flip eBook, animation magazine. To know more about this flip book maker, you can take a look at the below information. In addition to enabling you to publish flip book from Text files, Free Flip Book Maker also allows you to customize the exported flip publication in your style. There are many beautiful pre-designed templates to choose. And you can also customize a theme based on a selected template: select image for background, add background sound, set color, enable or disable configurable features such as hardcover, print, download, share, search, etc. Besides, you can save and export the settings as a theme for future use. After you finish customizing the flash page flip book, you can publish it in selectable form. 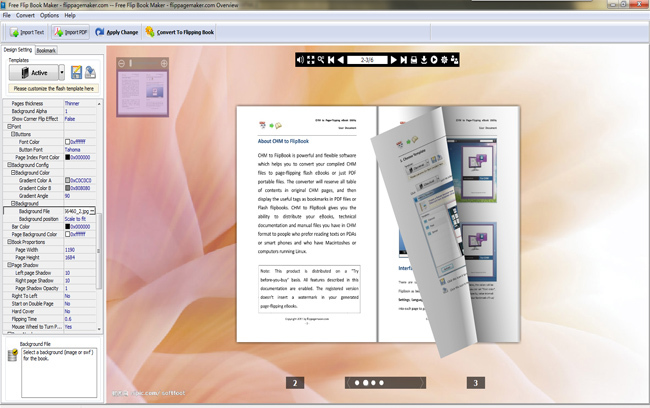 You can transform the Text file into HTML online flip book which can be uploaded online to your website, and people can view it online via web browser, on computer or portable devices. And you can also output the flip book in ZIP to send out or EXE to run as standalone file. You might have readers from different countries and they speak different languages. Free Flip Book Maker provides you with different languages. And some built-in templates even allow you to choose multiple languages so that readers can switch language easily.